It might only look that way. See Clutch, WPA/LI, and the Home Run Bias by Kincaid of 3-D Baseball and HR Bias in Clutch scores, based on Situational Wins (WPA/LI) by Tangotiger. Don't Let Your Little Leaguers Grow Up To Be Right-Handed Power Hitters Who Strike Out Alot Because They Might Choke In the Clutch. I also did something several years ago called "Do Power Hitters Choke in the Clutch?" it is at Do Power Hitters Choke in the Clutch? I also did something similar to what you did here by just comparing WPA to linear weights in my presentation on clutch in 2002 at the Boston SABR convention. 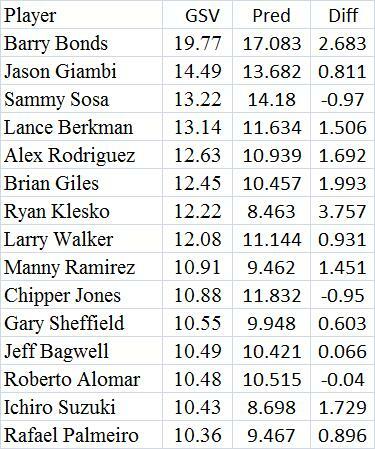 I had Bonds doing better in the clutch than his linear weights stats would predict. "Game State Victories (GSV) is the number of wins a player contributes to his team by measuring the change in the probability of his team winning the game as a result of his At-Bat. It gives greater weight to hits made when the score is close late in the game than those made when the score difference is large or early in the game." GSV may be similar to Bennett’s PGP (player game percentage) and the Mills brothers’ Player Win Average. The .819 means that 81.9% of the variation between hitters in GSV is explained by the 6 independent, nonclutch variables. So 81.9% of the weighted clutch performance is explained by nonclutch performance. At most, 18.1% could be explained by clutch ability. Tom Ruane On "When Winning Streaks Collide"
Fun stuff. Click here to go to it. The Yankees and Nationals both have 6 game streaks and they are about to play each other. Tom shows this is kind of thing is pretty rare. Could Bob Gibson Have Been Better In 1970 Than In 1968? Once I found the ERA predicted by this equation for each pitcher (Pred in the table below), I divided it by the league ERA in the relevant year. That number is called Ratio. 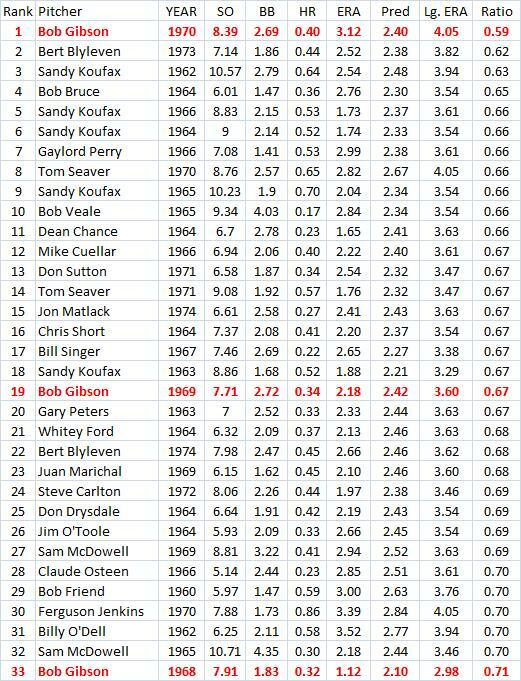 The lowest ratio belongs to Gibson in 1970 with .59. Notice that he had more strikeouts per 9 IP in 1970 than in 1968. The walks were a good bit higher but HRs were pretty close. And the league ERA was much higher in 1970 (4.05 vs. 2.98). 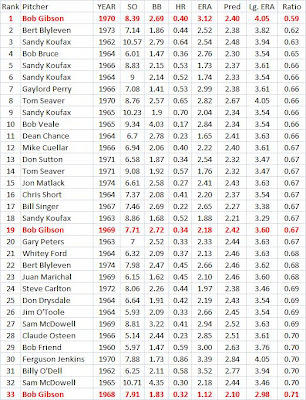 My crude Fielding Independent ERA for Gibson in 1968 is 2.10. But for 1970 it is only a little higher at 2.40. Did Bobby Abreu Have Good Numbers In The Clutch? He was booed last night in Philadelphia. See Why Phils fans shouldn't boo Abreu by LESLIE GUDEL of csnphilly.com. One commenter said "Good numbers, but never in the clutch." Let's look at those numbers even though clutch hitting is no big deal. To see Abreu's career clutch numbers, go to this Baseball Reference page: Career Batting Splits. He has a higher AVG with RISP and runners on than with no runners on. A higher SLG with runners on than with no runners on. No his AVG in Late & Close situations is lower than overall, but that is true for baseball in general. See my article Did The Increased Use Of Relief Pitching Cause A Decline In Clutch Hitting? Usually, AVG falls by even more than what we see for Abreu (it is actually bigger than the .009 we see since my table does not show his non-Late & Close AVG). Abreu hit .295 in non-Late & Close situations. But hs .011 drop is still not quite as big as normal. And his OBP goes up. Getting on base in Late & Close situations is pretty important. If you want to be technical, we can take IBBs out of the mix. 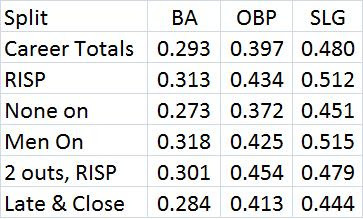 Then his OBP falls from .395 in non-Late & Close situations (using just AB, H, BB, HBP) to .394 in Late & Close situations. Just staying at the same level is good. It usually falls. See General Clutch Data. Now that only covers 1991-2000, but I think it would be similar over Abreu's career. And just think, the other teams thought he was good enough to intentionally walk alot in Late & Close situations. 3.6% of his Late & Close PAs were IBBs. It was only 1.1% overall. So his IBB rate more than tripled in Late & Close situations. Last year in MLB, it was about 2.34 times higher. Now someone at that site says you need to look at key games and that he did not come through often enough (no specifics are mentioned, though). But if you look at his splits, you can see his career OPS in Sept/Oct is .895, higher than his overall .877. Seems like he hit well in that month, which is most likely to have key games. Also, his career AVG in post-season games is .284, pretty good considering that you are facing better pitching than normal in cool weather. And I think those are key games. Now the same guy is saying he batted only .243 in Sept of 2005 when they just missed the playoffs. But he still had a .388 OBP. Besides, one month is hardly enough to say he was not good in the clutch. He also batted .320 in August that year, which probably had some key games. This guy also fails to mention that when Abreu hit .294 in Sept of 2001, the Phillies only finished 2 games behind the Braves. A close race and Abreu hit well. Yes, Chris Sale of the White Sox leads the AL in ERA (with 2.30). Strasburg is 4th in the NL with 2.35. The table below has some statistical comparisons. 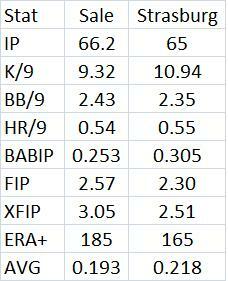 FIP ERA and xFIP ERA are from Fangraphs and I have the definitions below. ERA+ is from Baseball Reference. Strasburg, using Baseball Reference splits, has struck out 27.7% of the non-pitchers he has faced this year. Sale has 26.3%. Very close. The league average FIP's and xFIPs are not the same in each league. For Sale, his FIP and xFIP as a % of the league average are .624 and .753. Strasburg has .608 and .654. So they are very close, at least in FIP ERA. I am not sure if Fangraphs takes park effects into account on FIP and xFIP, but the pitching park factors from Baseball Reference for Sale from 2010-2012 are 103-106-105, meaning it scores 3-5% more than average and Strasburg has 99-100-100, meaning it is just about average. So Sale's park hurts him a little more than Strasburg's. Sale has a big lead in ERA+ which is ERA adjusted for the league averae and park effects at Baseball Reference. It could be due to Sale's lower BABIP. If he had Strasburg's .305, it looks like it would add 9 hits and that, on average, would be about 4.5 runs. That would give Sale an ERA of 2.90 and I think his ERA+ then would be about 150. Then Strasburg would have a big edge. FIP: Fielding Independent Pitching (FIP) measures what a player’s ERA should have looked like over a given time period, assuming that performance on balls in play and timing were league average. xFIP: Expected Fielding Independent Pitching (xFIP) is a regressed version of FIP, developed by Dave Studeman from The Hardball Times. It’s calculated in the same way as FIP, except it replaces a pitcher’s home run total with an estimate of how many home runs they should have allowed. This estimate is calculated by taking the league-average home run to fly ball rate (~9-10% depending on the year) and multiplying it by a pitcher’s fly ball rate.